"Asynchronously Live from San Francisco"
This year I was quite busy preparing for my own presentation as well as organizing the necessary technology for the symposium and orchestrating several events for the International Society for Mental Health Online (ISMHO), of which I am President for year 2001. It was also my privilege to present one of two ISMHO awards for Distinguished Contributions to our understanding of online mental health, by students, who each received cash awards of $500 each, hopefully establishing a precedent for future years and projects. Some of the presentations I'd planned on attending were cancelled, and as usual, often there were just too many good presentations scheduled for the exact same time. (APA - We *really* need the option of having sessions taped in order to fully appreciate the range of options and presenters on hand at these huge conventions!) A very big THANK YOU to Jeffrey Barnett of APA's Independent Practice division (who sponsored my event) along with the other 7 co-sponsoring divisions, to Candy Won (APA) as well as to those who helped make our annual ISMHO dinner a huge success (Psychonline, MyTherapyNet, and HelpHorizons). And of course to my co-presenters, John Suler, Dave Nickelson, and Nancy Kalish. And to all who came to join us. With apologies for fewer-than-usual articles, here are at least some selected events from this year's APA convention, described "asynchronously live" which it is my pleasure to share. Even before this afternoon's opening keynote speech, the day began for this intrepid reporter by attending a very interesting (and crisply presented) panel symposium. There were quite a few good presentations happening at the same time, unfortunately, and I would have loved to also attend those on psychology and secondary schools, on data sharing, IQ, bullying, research issues, and a host of other topics of great interest to me, all at the same exact time, unfortunately. I wound up going to a very informed and crisply engaging symposium on a topic near and dear to me (and quite "in sync" with the presentation which yours truly will be doing on Monday). These are people who really know their topic! Nice to see familiar names and faces, too. "Psychology Online-- Current Issues in Behavioral Telehealth"
Chaired by Dr. Abraham Wolf, participants included several experts on the legal and practical issues being experienced today, by individual practitioners as well as the general public. David Nickelson, Psy.D., J.D. (APA's Director of Technology and Special Projects) began with an inside look at "Psychological Services and the Internet: Regulated Practice in an Unregulated Environment?" Dr. Nickelson began by highlighting some of the many grey areas which are presented both legally and ethically in the practice of regulated professions (such as psychology) in an environment such as the Internet, which defies traditional notions of jurisdictional boundaries. He noted that the Internet and it's various uses can promote unique interpersonal relationships which really need to be better understood. Such well-known phenomena as the "disinhibition effect" were cited, and Dr. Nickelson also noted that online mental health offerings run along a continuum, from things like psychological information to self-help materials to assessment, diagnosis, and treatment . I could elaborate more on this, but won't, since what he said is very similar to what I'll be presenting in a few days, myself. Needless to say, we think quite alike in terms of seeing a need for change in licensing and regulatory thinking, with a positive outcome being something like the nurse's concept of a "driver's license" model, where it is conceded that if one has a skill (whether driving, nursing, or practicing psychology), one is equally skilled even if only briefly "driving through" the state (or Cyberspace). In re-stating the common sense of the nurses' "drivers' license model" for resolving interstate licensing disputes, Dr. Nickelson noted that "69% of states' regulatory boards have not yet received [any] complaints about online therapy". 17 percent have. The rest? Finally, Dr. Nickelson addressed the status across various states in terms of law suits, and how "scope is a slippery term" because "it seems like a post-test analysis" often, forcing examination of "scope" only after a party is injured. He noted that there are several sets of existing guidelines which address both the ethical and practical concerns regarding online work by mental health practitioners, including the guidelines of ISMHO (www.ismho.org) and the ACA. [There's NBCC too.] Meanwhile, Dr. Nickelson is working within APA to promote consumer information and self-help with projects such as his "DotComSense" brochure, available in hard copy or at www.dotcomsense.com. He promises that very soon, there will be "lots more coming on the APA website." Gerald Koocher, Ph.D.,, of Harvard Medical School (and trustee of the APAIT insurance organization) followed with a presentation about the "Challenges to Professional Integrity in Telehealth Practice". Dr. Koocher mentioned other experiential factors which need to be acknowledged also, such as the "spontaneity factor" and the risk of losing valuable information in not being able to consider tone of voice, etc. And he noted that even with the technology of cell phones, interceptions have been made which serve as reminders that our security may not be as great as we think. Dr. Koocher also addressed the licensing issue, and how in fact there are a few "loopholes" which do allow occasional practice under rare circumstances, in a state one is not licensed in, sparing the need to hold multiple licenses. For example, even in California, which explicitly forbids practicing psychology "in California" unless licensed there, a law states that one can practice "for less than 10 days". Converting that to 240 hours would yield a lot of wiggle room under that law, for occasional online work. The issue of "where does treatment take place", despite California's unilateral decision that it takes place in their residents' computers, is clearly unresolved. Dr. Koocher knows of only one case where someone pursued a therapist for legal remedy, across state borders. In this instance it was against a California therapist who moved out of state but continued *telephone* treatment from his/her new location. It was only because this therapist was in fact licensed in California that the California resident who initiated action was able to take action. Like Dr. Nickelson, he issued "an appeal to clinicians' integrity" and noted the need to be especially cautious now, "as in any new practice area". As an APA task force member for the new ethics guidelines, he sees the movement within organized psychology as being *away* from the separate ethical guidelines some are calling for to govern specifically online work. While the arguments about the uniqueness of such work are duly noted, the thinking is that if one is competent to practice law or medicine or psychology, whatever, it should be "generic" competency as a professional, and not only in some specific niche. This way it is more likely "to stand up over time". He emphasized that with online work, just as offline, therapists need to be knowledgeable about such questions as "Does it work? ", "What limitations apply? ", confidentiality, and "What would I do in an emergency". John Grohol, Psy.D., a co-founder of ISMHO, online community leader, and pioneering webmaster/researcher for numerous mental health websites since the mid 1990's, presented "dot.com.this: State of the Internet Behavioral Health Care Industry." Dr. Grohol presented a rather sober look at how many of last year's upstart dotcoms are no longer with us*, though he noted some strong survivors amidst the "significant number of consolidations and mergers" in the face of the current economy. In contrast with the Dot.com boom of only a year ago, the landscape now looks very different suddenly. He summed it up in one word: Change. "What's Happening Now?" The industry is "housekeeping with mergers", amidst a general suspicion now about new Internet-based services and businesses, and a drying up of venture capital in reaction to a feeling that "they've been burned". So what's in the future? In the immediate future Dr. Grohol sees a rather conservative environment, where realistic, proven business plans are what is being sought. He sees a trend towards partnering with larger, well-known brick-and-morar businesses while at the same time there will be an emergence of small operations with "technology driven by need". Leigh Jerome, Ph.D., of the Tripler Army Medical Center rounded out the presentation with a presentation titled "Hot Links to a Digital Future"
Dr. Jerome began by taking a look at how "telehealth" is defined, and proceeded to make the argument that "it is not a distinct profession" but rather a service delivery model which can be accessed readily by large numbers of people who apparently turn to the Net for help of every variety. In terms of utilization, "more than 100 million adults in the U.S. turn to the Internet for health information", especially anxiety and depression. The information is easy to find, as there are now over 15,000 health information sites, plus in addition there are chat rooms, support groups, etc. Dr. Jerome believes that in general the Internet is still under-utilized, with the exception of *informational* services. In some areas of health, such as general medical practice, "the medical record is becoming dynamic". Yet, as Dr. Koocher had also noted, most regulations are still based on paper records. This is so even in an age where digital MRI scans can be instantly shared and stored. Other medical applications are beginning to include such things as pre-surgical simulation, though this has some unique challenges, such as providing realistic feedback and training in hand pressure, etc. Data transfer is another area easily facilitated by online communication-- things like blood glucose readings, etc.-- and clearly could be used readily by some patients and their healthcare professional. While focusing mostly on the upside of the technology, Dr. Jerome noted that inevitably there is also a downside: "new technologies, new pathologies". For example, more than 1 million users each year are "cyber-stalked". People can be impersonated or have their identities stolen, sometimes with victims watching as others purport to be them. And of course there can be malicious dmage such as hacking, introducing viruses, etc. Finally, Dr. Jerome suggested "new foci" for clinical practice opportunities, and promotion of "expanded scope, and increased access to care". As an example of easy opportunities: why not introduce "kiosks" in waiting room areas wher patients can productively spend their time looking up information. In addition to evolving practice innovations, she looks towards new developments which will occur in reaction to improvements in areas such as wireless portability, bio sensors, and Virtual Reality. Dr. DeLeon began by sharing some of the history about Congressional actions regarding "telemedicine" versus "telehealth", including the fact that he had previously disagreed with Dr. Nickelson's efforts to change the term from "medicine" to "health" to protect against all of mental health online becoming "medicalized". At the time, Dr. Koop, surgeon general, was promoting "telemedicine" and had a great deal of prestige and clout, etc., and Dr. DeLeon's concern was that passage of a strong bill would be helpful in terms of litigation alleging "harm", as in medical suits the harm typically needs to be physical. In any case, Dr. DeLeon also noted that psychologists, having 7 years training, typically, are among the most qualified of all professionals to be part of the telehealth/telemedicine revolution. He gave examples of how technology is used routinely on the Big Island of Hawai'i, to make quick assessments, for example, of whether a helicopter evacuation was urgently neeeded. But still, the massive community health centers of Hawaii, as elsewhere, typically have an incredible potential which they keep "in the closet and don't know how to use it." He would personally like psychology to be in the lead here, given our training and expertise in behavior in mental health. He sees consumers as calling out for better and more accessible information, too, for example using the Internet independently to acquire useful information on asthma treatment for their children. Dr. DeLeon continued with several examples of every day routine life among other professionals (e.g., pharmacists who routinely hold national elections for their association, online) and in daily lives of all organizations and their members. Dr. DeLeon noted how his daugher wondered why he keeps getting all this (snail) mail from APA.... "why waste money on mailings?". Why not utilize the net even more? (This is something ,apparently, that APA does have as a goal, though elections may not happen online for a while). Highlighting the importance of good information, Dr. DeLeon noted that 87,000 people died in hospitals last year, due to medical error. The biggest single factor? Medication. The error rate drops 70% if a clinical pharmacist is on duty making rounds. Now that everything is computer programmed in terms of injections, dosages, etc, he sees great potential in utilizing available knowledge to cut error rates, and thus save lives. "We need to move forward", he said. "This is the future." What are the hurdles? For one, there is the issue of national licensure. While he thinks it is realistically years off, he finds it insulting that one or another state would imply that a professional is incompetent simply because of not being a resident there. "How dare California say they're brighter than Hawaii?" Like Dr. Nickelson, he sited the "nurses' driver's license model" as an eminently simple and sensible solution. Finally, there was a brief Q&A which included questions about the limited efficacy studies out there, the outlook for a voluntary licensing plan (as opposed to mandated), and about ethics. Asked how the concept of *privilege* might apply to telehealth, Dr. Nickelson said that one needs to think ahead, in accordance with normal ethical practice, by being sure to provide informed consent. He noted that even the American Bar Association is now struggling with the issue of privilege, given the current legal/regulatory climate. This presentation highlighted some of the issues involved in approaching online services from a business and service delivery perspective. A basic premise, however, was that many services being offered now or in the near-future, do not fall into easy categories nor do they necessarily fit people's preconceptions of what "online therapy" or "E-therapy" is, or how practitioners are actually providing services. Last year John Grohol, Psy.D., known for his pioneering work with Mental Health Net, his work with leading telehealth providers, and a wide array of online mental health activities, obliged the audience by explaining what "E-therapy" IS... This year we had the pleasure of learning, "What is E-therapy NOT?" Some of the things that eTherapy typically does NOT provide, according to Dr. Grohol, are traditional psychotherapy or counseling, nor treatment of most mental distorders, without a face-to-face evaluation. After an overview of the many modalities available online, both synchronous and asynchronous (including everthing from e-mail and chat rooms through video conferencing and VR treatments for anxiety disorders), Dr. Grohol turned to some of the many potential benefits which are so compelling as to fuel continued efforts to make these services widely accessible. Some of the benefits include confidentiality/privacy (with adequate protections! ), affordable costs for both providers and consumers, convenience ("You can e-mail a dream" while it's fresh!) and a format which lends itself towards goal-focused treatment, with less chit-chat, more direct (dis-inhibited) discussion of what's really at the heart of daily problems. Dr. Grohol noted how in fact, e-communication is widely used also, as an adjunct support, rather than as the entire basis for treatment. Dr. Grohol then discussed the risks inherent in online work, highlighting the lack of nonverbal cues, even for those who employ emoticons and are well-versed in e-mail. Also mentioned were legal/ethical issues, having "mostly to do with licensing" [but also involving some basic tenets such as "informed consent", emergency contact issues, etc.]. While Dr. Grohol was clear that he believes "we cannot hold a higher standard" for online than offline work, he did acknowledge that assessment of problems online "can be more difficult", and moreover, there remain serious "training issues" at this time, where very few people have the benefit of graduate training and/or continuing education specifically addressing the unique nature of online work. Dr. Grohol, finally, looked at what's become of the dot-coms in recent months-- something discussed in more detail at yesterday's symposium on Behavioral Telehealth. (That report is at http://www.fenichel.com/ismhopanel2001.shtml.) As for the future of the e-health *industry*, Dr. Grohol sees "consolidation & growth" along with development of training and treatment standards ("emerging even as we speak! "), and a gradual adoption of "evolutionary technology" as broadband access becomes more accepted and accessible and other technological advances shape our lives as well. After explaining that his name is real (from native American origins), Storm King went on to reiterate that "E-mail and chat room therapy is not 'therapy', it is 'e-therapy'." Fortunately, rather than just focusing on the terminology, he went on to discuss how online work carries with it "a unique set of positives and negatives." The amount of online work being done in fact continues to grow, which he attributed squarely to consumer demand. While presenting an historical overview suggesting how in fact the emergence of "technotherapy" (Kelley, 1994) has "fit the bill" for a multitude of people, King also stated categorically that "If the practitioner is not intimately familiar with the nuances of text-based relationships, the potential to do more harm than good exists". On the other hand, competent, sensitive online work has been demonstrated to be very effective in the treatment of social anxiety, and other related difficulties. He cited Craig Childress' (1998) observation that online consultation may also be beneficial for those whose presenting problems are "non-clinical". King went on to describe the power of online communication while debunking the notion that one is not really relating to others online. ("You cannot have a relationship with 'nobody'"). Also, since one is missing many cues, and "the mind abhors a vacuum" it becomes very easy to project attributes into messages, which may be accurate, or may be distorted. Factors such as the "mood congruent effect" were described. (E.g., when one comes in tense from a dispute it is possible to interpret a benign or friendly message as hostile, etc.) Also, the increasingly well-recognized phenomenon of "disinhibition" was discussed. One example where projection and distortion may be observed quite commonly, is that of online romance. When Mr. King asked "How many people know someone who's had a cyber-romance" about 80% of the audience raised their hands. This, he noted, was a phenomenon of great popularity, despite the fact that "99% of cues are missing", requiring use of internal projection. As another example of how nuance and mood can be easily mis-read, he offered the case of an e-mail message saying "I disagree", which can give rise to "all sorts of potential reactions". On a more practical note, King also noted the inherent nature of text-based work as being dependent on not only Internet or computer skills, but writing skills, too. "If you are not adept at this medium, you have no business doing it". Even aside from doing things like therapy or counseling, but in everyday social interactions, it is the case that "typing off the top of your head" sometimes comes off not as conversational, but as "colder and more impersonal than the author intended." He cited the 1999 work of Azy Barak, who described a "unique mechanism" we employ in reading and writing email exchanges. Finally, Mr. King spoke as to the unique ethical issues which have arisen in response to both the benefits and risks of e-Therapy, in particular. For example, a client now must at least "partially responsible" in terms of maintaining confidentiality (given that text-based messages reside not only with the "e-therapist" but also on the computer of the client). Aside from confidentiality, issues of legal jurisdiction are unclear, while ethical dilemmas may become stickier with such questions as "when does a professional relationship exist". Interestingly, at this point two comments from the mostly savvy audience were made, the first suggesting that unless records sent to the client were "read-only", this opens the door to liability issues, and the second explaining that it is possible for someone to change what was written and use it as evidence of malpractice. Storm King next took a look at the global nature of online work as well as the importance of thinking about such serious matters as suicidality assessment. On one hand these are very real and vital concerns. OTOH, if the risks and preparation are seen as too great to proceed at all with providing *any* accessible online mental health services, then "who will be available" for those in need? (King, quoting from Gary Stofle) If we are going to proceed, which consumers seem to be demanding, then it is very important that those who do work on line be adequately educated and well trained. Some of the suggestions for training include use of Sample cases, suggestions for a range of responses to typical online communications (e.g., "I think you might be missing the point"). Of major concern are the crisis management issues mentioned earlier, such as assessment of suicidality, and effective, ethical response. Some important things to consider when doing online work include obtaining real-life contact information, having a release to contact a primary care physician if necessary, providing confidential communication (e.g, use of electronic signatures). [Not everyone is in fact suitable for online treatment, which is the topic of a recent paper by ISMHO's Case Study Group.] King noted also that things are not always as they seem when presented with suicidal content online. Disinhibition can play a big role here. But "difficulties with online assessment make it hard to know how severe the client's pathology may be." Finally, Storm King re-iterated some of his favorite definitions of "anarchy", which is how he conceptualizes the Internet, underscoring the basis for his belief that the boundary-less Net is something truly unique. He ended with some words of advice: "The Information Revolution rolls on... don't let it roll over you." Dr. Weingardt began with a broad overview of the state of E-therapy, first defining it as "electronically mediated one-on-one interaction with a psychologist or other mental health professional" He went on to discuss various business models now being seen, ranging from the private practitioner with a website (of which there are many) to private-practice e-therapists, to large companies. Billing for services can take the form of fees paid by the minute, per response, or a wide variety of other pricing options. Some sites (one of which was discussed) may bill for "prep time" or even research and legal fees, and so one should definitely research a company before agreeing to any unusual payment contracts. Dr. Weingardt mentioned how Martha Ainworth's Metanoia site offers consumers a "comprehensive independent consumer guide". Other variations proving successful, within the small business model, include maintaining a directory, basing services on fees (transaction or registration), and offering "a virtual office space" with many automated functions and productivity helpers. From a business perspective, what are some problems? First of all, "it's not scalable" -- i.e., you can't reach a million people no matter how well you market, with only 100 therapists, where maybe 5 will be online at any given time. Secondly, the profits are very thin, given the costs of security and infrastructure. Also, contrary to the assertions of some, "It's an unproven market. Sure, there is a need, but people don't utilize it... Who's to say they want your services?" Moreover, there are liability issues. Although no big cases have emerged (yet) Dr. Weingardt noted that within his dot-com, "there's always the thought--it's not a question of if we'll be sued, but when...". Another successful business model is tha of Epotec, who call themselves "the behavioral health care connection" and who are doing quite well by going after the EAP market. They now have as clients over 40 Managed Behavioral Healthchare Organizations, with services available to over 700 companies. A major focus is 2ndary prevention. They offer "secure, anonymous, self-paced, interactive programs". So what does the future hold? Dr. Weingardt sees a continuation of the "historical stronghold" enjoyed by private pratitioners engaging in "e-therapy". He sees a great deal of potential but, agreeing with an earlier comment by Dr. Grohol, noted that "bandwidth is the issue" insofar as some aspects of online work. In terms of big dot-coms, at the moment there simply is "no more venture capital", though small business can grow slowly and steadily in this environment. While some larger providers remain strong (such as HelpHorizons), he also sees an enormous, emerging market for "self-paced, self-help web applications". He is very excited (and reported that his excitement is shared within NIH) by "the delivery of psychological or psycho-therapeutic content via the Internet". How do we break out of boxes, blend modalities, and create new opportunities from the options before us at this moment in time? "Imagine the possibilities..."
Dr.Zack began, as fate would have it, by asking the same question I was going to ask 2 days later at my own presentation: How many people want to know "What's a browser?". Well, as I've observed myself in the past year, that question is asked much less. This audience clearly knew (with perhaps one exception). Of course, he said, "if significantly lacking one, you *may* be able to make it up with the others". He continued to present some other formulas regarding functions such as "frustration", for example, with a platform. He views a continuum of technological platforms, and sees them being used in different ways from the "first generation corporate suites" to newer generations, which are "not as fancy, but still around". In terms of individual practitioners looking for the best personal option, Dr. Zack noted that there are also compromises available, such as sites which offer free templates and basic email and office management tools. Some of these are a trade-off, however, as they are relatively easy to get up and running but one lacks control and also absolute knowledge regarding privacy and other important issues. As for a web page (with "How do I make a web site" overtaking "What's a browser" in my recent experience! ), Dr. Zack noted the wide range of options available ranging from a simple business-card style page and the domain name BobTherapist.com (or whatever), to very elaborate, theme-organized custom-design sites. In truth, there are only 4 requirements, which he laid out: (1) A domain name, via a registrar (2) a host, with a server (3) site contents, such as graphics and text, and (4) functionality, so that when it's all put together, it works. Required equipment includes hardware (computer, webcam, etc. ), software (e.g., a browser such as IE 5.0, client software for various media, etc), security (such as a firewall and PGP), and a connection to an ISP. Of course, it's getting easier all the time. "With improvement in laptops, not only can the client be mobile, you can too." An audience member asked the relevant question, "Can video be encrypted?". Answer: No. Other aspects of technology include the ability to easily do "virtual office administration", including scheduling, case management, billing, and client records. [APA's Director of Technology Policy and Projects spoke at the 2001: Cyberspace Odyssey panel about how new regulations are going to virtually demand that paper records be replaced with online filing.] Finally, services such as Paypal now allow very easy and inexpensive payment for just about anyone. At the end of this presentation, the panel was opened to questions from the audience. The first was, "What cues do consumers use to make a choice of [online] psychologist?". Dr. Weingardt immediately replied "Price!". Dr.Grohol agreed, noting that one way of attracting business may be to allow the client to have one very low-cost consultation (e.g., $5 USD) in order for them to try the service and see what it entails. Dr. Zack added that having a video clip on one's web site makes a difference, and Dr. Grohol commented that just having a photograph can give a better sense of the therapist and help a client feel comfortable with a choice. Another QUESTION: "What is the most popular form of online mental health services?" ANSWER: E-mail, by far, about 95% at HelpHorizons. [This closely matches a recent survey by APA, as well.] Aside from the ease and convenience, it is also seen as being the most cost-effective. Last Question: Suggestions for limiting liability? Answer: Practice only what you are competent [and licensed] to do, and stay within ethical/legal boundaries, such as they may be. Michael Fenichel, Ph.D., clinical psychologist, President of the International Society for Mental Health Online, and publisher of Current Topics in Psychology (this website), presented the following, approximately. The audience/reader is asked: Does anyone here really doubt that the Internet has deeply touched the lives of us all? The communication revolution has affected our way of life, and this is a reality which has not escaped the healthcare/psychology/counseling professions. As practitioners, even in exclusively office-based practice we are virtually assured of seeing clients whose lives are influenced to a major extent, by time spent communicating or entertainment-surfing on the Internet. Think about teens, for a start. An overwhelming percentage of teens report that they "multi-task" while online, and favor real-time chat more so than do adults. (They also buy less, and spend less time online, because for them, it's just one more tool for communication, and they "don't know anything else", as one teen newspaper reporter explained.) And some people simply prefer reading books. Or chatting online. Or on the phone. Or texting. This is life in the 21st century. Yes there are those (of all ages) too, who may have very rich lives, real or virtual, who are connected to others on the web, but whose lives *offline* are painful, and who may be among those most likely to be online looking for counseling, support, or knowledge for self-help via the Internet. Some do seem to become "addicted". Others effortlessly embrace the Internet as a tool for work and for social discourse, and have integrated computers and new communication technologies well, not giving the hardware a thought, and utilizing the tools with such natural facility that the computer becomes quite transparent. Now when did this all happen? Here are a few socio-historical markers along the Internet highway, which reflect the evolution and revolution in Internet-facilitated daily life. 1999: 56% of all US adults (114M) are online, at home or work or school. 2000, or, the dreaded Y2k: The planet continued to exist. Domain names disappear. The Internet is here, and it is a powerful force in people's lives, worldwide. This bit of history is to remind old-timers of how recently this global phenomenon has virtually exploded, while also being for the benefit of those relatively new to the joys of online experience. That's a"fast forward" view of just the past 2-3 years, to see how extensively our society and culture has embraced so many aspects of the Internet's potential for communication and information. Just in case there were still any skeptics who don't believe online activity is here to stay, and pervasively affecting our way of life, some digital slides (from a digital camera) were presented, ranging from some recent scary newspaper headlines about Internet Fiends, to a front page magazine cover about fears of Internet worms, to some glossy colorful depictions of a brave new world for medical information. And yet it is important to acknowledge, as depicted in a cute cartoon [which I'm seeking permission to re-print], that despite all the benefits and potential of 21st Century technology, there still will be those who haven't yet become excited. Practitioners should note that there are new types of lifestyle-related issues which both online and offline psychologists will be presented with, even such things as "irrational fear" of computer viruses, or victimization by cyber-stalkers, or trauma due to escalated passions generated on a list-serv "flame war". At this point (and I'm happy to say I've obtained the artist's permission to share this), I used a second cartoon to illustrate both the risks and benefits of e-mail lists, one of our most powerful tools for sharing ideas and information within groups. At this point the presentation changed gears to a look at the present Internet landscape, as Dr. John Suler tuned up his crystal ball, ready to take us into the future. A live web page with links to mental health sites representing a wide range of "psychology online" was used to facilitate a guided tour around the web. First came a look at several of the positive aspects being harnessed by psychologists and others, for education, self-help, treatment, supervision, etc. Some of the sites, such as the Google page, offer some interesting demographics, in terms of what languages and countries are seen on the web, what browsers are most popular, etc. One site ranks the most popular mental health sites online, the top nine. Do you think the top one is APA, or ApA? Think again... it is Queendom.com, which features self-administered "IQ" and "personality" tests. Another site on the tour is a user-friendly and pretty page about "Flowers for Algernon", which both describes the world of a friendly mildly mentally retarded individual, and gives a hands-on look at Rorschach testing. Geared for high school students to make psychology accessible. And more. As you'll see, many of these sites simply offer information, or biographies of individual providers, which is a large segment of the web, with many private practitioners as well as group practices simply having an "online calling card". Other sites offer e-counseling, or therapy, or coaching, or whatever. Some of these may be inspirational, others may serve as good examples of why consumers need education and regulatory protections. At the same time it is clear that we have a continued need for increased research, graduate education, and continuing education for practitioners. Nancy Kalish, Ph.D., author and researcher into lost lovers and rekindled romances, advice expert to teens online (www.lovestories.com), and online message board hostess at www.lostlovers.com, presented an overview of how adolescents and adults interact with the Internet in the pursuit of new, or lost lovers. The power of the Internet to facilitate such efforts, is of course quite apparent. Almost everyone, it seems, also knows of someone who has had some type of "online romance". As Dr. Kalish noted, it is very easy to enlist online resources such as classmates.com or 411.com to search for lost friends or lovers. Once contact is made, well known factors such as disinhibition, and the power of "immediacy" can prompt rapid and intense formation of relationships. Dr. Kalish described the research she did from 1993-1996, enlisting more than 1000 respondents in her effort to look at how people were faring after locating "lost lovers". What she found was a very high percentage (72% at the time of the survey) had sustained their newly re-found relationships over time, 78% for first loves. A follow-up in year 2000 found that these relationships are still quite stable for the vast majority. "But there are down sides" she noted. "Marriages are crumbling" as one or another spouse decides that the first true love is preferable to the current marriage. However, Dr. Kalish cited evidence to suggest that probably 1/2 of the marriages which break up after re-finding lost lovers "were in trouble" prior to beginning the searches for lost loves. Dr. Kalish described how easy it is to begin the process which can lead to major life changes, with powerful consequences. It's simple to "just type in a name, do a search" out of curiosity. Then when one comes across the former love one wonders about "sending an e-mail seems innocent...[or] like typing to yourself, somehow it's not real.". The stories she's heard suggest that after some "innocent" e-mails, phone calls are next and "the angst begins". Even if the relationship seems wonderful, feelings of guilt, remorse about children, etc.... it can be a huge ordeal. Dr. Kalish feels her message boards are in fact "saving relationships" as people share their experiences, both positive and negative. Turning to the types of posts she sees on the teen site, Dr. Kalish noted that a majority of writers are aged 12-20, and a goodly number of writers tend to sign their name with something like "Confused". Typically, this is an accurate description, and so the website serves a useful function by facilitating reliable information as well a peer feedback and support. Dr. Kalish sees the Internet being a well-integrated part of daily life among college students, as well. In particular, students are using lists for study groups, offering enhanced "flexibility of time". On the other hand, there can be a downside: "Students' uncritical use of biased and incorrect information". [I've heard this too, for a few years now: students tend to think if it's online, it's accurate information, and conversely, if it's not online, it doesn't exist!] On a personal note, Dr. Kalish commented that the technology, while a boon, can present a challenge for both students and teachers with cell phones going off left and right, and other distractions which are new to the classroom environment. John Suler, Ph.D., cyberpsychology researcher, co-founder of ISMHO, professor of psychology, and the man who literally wrote the book on The Psychology of Cyberspace was next to present. Dr. Suler departed from our presentation of the recent past and current state of online behavior, to gaze into his crystal ball and see where what is already being explored may take us on our Cyberspace Odyssey into the 21st Century. Mr. Smith, who lives in Denver, emails an online clinical center that operates out of Sydney. The case manager from Toronto working at that center does an intake with Mr. Smith. He interivews him via email, conducts a video-conferencing session with him, does some online psychological testing, and decides that Smith might really benefit from EMDR or Somatic Experiencing Therapy. He sends Mr. Smith to some web sites with information about those therapies, as well as other treatments for trauma. Smith is interested in EMDR. The case manager checks the national network directory, finds seven certified EMDR clinicians in Denver. In an asynchronous user-to-user meeting, the case manager and the seven EMDR clinicians share information and video clips about the case. Three of them are interested in working with Mr. Smith. The case manager sends the web site addresses of the three clinicians to Smith. He checks out their site and decides to phone one of them. Soon thereafter, he begins f2f work with that clinician, who also happens to use intersession email and VR in his EMDR treatment. Sound far-fetched? Dr. Suler noted that now even smells are being shared across the Net... So "it's do-able, now... even giving out a mint!" In taking a brief look backwards, Dr. Suler recalled the relatively primitive automated "therapy" program, Eliza. He contrasted this with some of the newest software technology which is now available to consumers, complete with Artificial Intelligence engines, such as the Eudora e-mail program which now has very sophisticated "emotion filters" to help protect against precipitous responses which might be misunderstood across Cyberspace. David Nickelson, Psy.D., JD, director of Technology Policy and Projects for the American Psychological Association, addressed the state of affairs present and future, as he sees it from an ethical, legal, and practice point of view. Dr. Nickelson also spoke about the consumer point of view, noting APA's development of the DotComSense brochure and how APA is now moving in many new ways to facilitate practitioner and consumer comfort with the potential and risks of technology. In terms of reimbursement, here too our nation is increasingly acceptant of online services, with Medicaid now accepting billing for online work in at least 13 states. Medicare is moving towards a fee-for-service model which already includes reimbursement for individual psychotherapy covered under existing CPT codes. What about insurance coverage? This was a question from the audience. Dr. Nickelson explained that APAIT, and likely the other insurors, are basically concerned that practitioners practice "within your scope of practice", and then coverage does include online work, if one is licensed to practice, and competent to do what one is doing. The issue of licensure continues to be the 'sticky wicket', as there continues to be uncertainty about jurisdiction over transient Internet communication. (Where is the Internet?) Dr. Nickelson noted that despite some very conservatively interpreted regulations restricting any and all practice, some believe that even in the state of California, temporary practice should be recognized as acceptable under a Model Act (ASPPB) which allows for up to 30 days of practice by a licensed healthcare professional in a state other than one's own, if training and licensing requirements in the home state are considered "equivalent". Interestingly, in response to an audience question, as to whether it's really true that California alone is enforcing a particularly restrictive stance against psychologists who seek to occasionally consult from their own offices (wherever) with a California resident, Dr. Nickelson replied (you're hearing it here first!) that APA has in fact asked the psychology board of California for clarification "true or false" that they will refuse to make any exceptions such as permitted under the ASPPB model bill. There has not been any response as of yet, but when/if one comes, it will be shared with members. Dr. Nickelson gave some other examples of how things differ across the States. For example, in Nebraska, PA's can be supervised exclusively online. Despite the potential for psychology, and ubiquitious use of the Internet by consumers and practitioners, Dr. Nickelson noted that under APA's new ethics code (in process), things will not change, the reason being that "our core values have not changed". Ethical practice is considered to be ethical online and off. Competency, informed consent, etc., are just as applicable across modalities, and the committee writing the revisions believes that just as past references to paper became obsolete, referring specifically to a current technology or media would not add anything to the basic tenets of ethical practice. 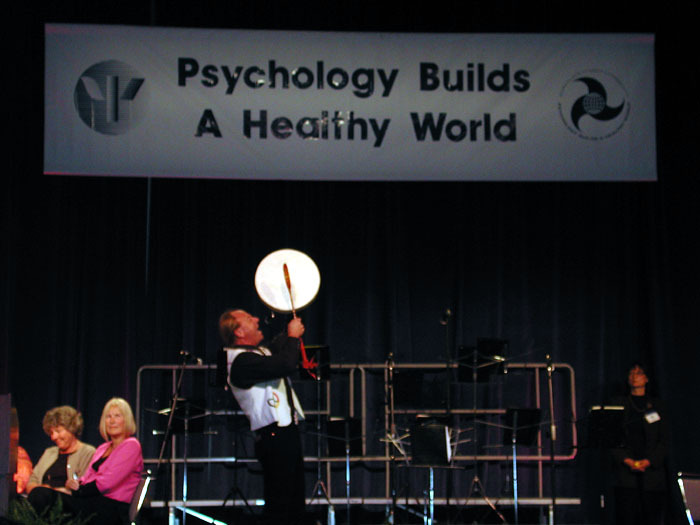 What's in the future at APA? For starts, we now have "a new advocacy wing", in APA's Office of Technology Policy & Projects. It's director: David Nickelson, who has pledged to promote the use of Internet-facilitated technology and to work towards moving the monolith association into the 21st century as quickly as possible. There is now research being undertaken to look at "what is actually being done" online, and the new APA Practice Net project is "taking snapshops" and developing an "incredible database" reflecting how psychologists are utilizing the Internet, through ongoing real-time sampling. Meanwhile, Dr. Nickelson pledged that he will continue his own efforts to "try to integrate telehealth into APA activities" to the extent possible. As time ran out, the audience had more questions.... Next year in Chicago? 108th Annual Convention - August 2000, Washington, D.C. These edited reports were originally posted to the Current Topics list-serv August 4-8, 2000. This year I have updated my "asynchronously live" reports from fin-de-siecle APA Conventions, and have posted summaries of sessions, many with photos, and some with references to other pages for more information on various aspects of psychology, cyberpsychology or Washington. In last year's APA Live report (1999), as we neared the end of the 20th Century, I offered in my reports a great many basic source references from the presentations at APA -- regarding Internet use, public practice and violence prevention, mostly and almost all of which are still fresh (and live links). That information is provided below, or at http://www.fenichel.com/APAlive.shtml . Now, in the year 2000 and facing the daunting challenge on reporting back to at least 5 list-servs, 3 organizations, and a whole bunch of friends and colleagues, I tried to simplify the writing (for me) while also getting a chance to use my new digital camera-toy productively. The result is several overlapping pages of photos, several with links to summary articles on separate pages (with photo, of course). It seems to work! Just follow the links of interest, which generally divide into 3 areas: An APA Convention Overiew, ISMHO Events page, and a look at APA's media division members and presentations. Well, make that 4 areas, since there are some pages DC Digital Photography, too. Here are the highlights, fresh off the web press, and you are invited to explore whatever is of interest.... Not every picture tells a story, but some do! I hope this collection of text-based and photographic images provides a sense of the energy and excitement which was generated. Sight-seeing, and summary reports on APA symposia (including the Beck-Ellis dialogue, a cyberpsychology panel addressing online mental health issues, and a Town Hall meeting about the digital crossroads we are at, as a culture.) Close-ups of ISMHO member activities, and APA's Division 46 (Media) presentations. Includes discussion of research about how therapists are portrayed in film and how media affects the cuture (via movie quotes). Photographs of DC, including some APA events and reports. This page accentuates the sight-seeing and photography. Close-up on ISMHO members , including the symposium on eTherapy and online communication... Also, photos from the annual dinner and at various convention activities. A capsule summary of a very interesting panel on where we stand and what we know in terms of online mental health service delivery, and the pros and cons of online communication. With John Grohol, John Suler, Storm King, and Yvette Colon. The historic dialogue between Aaron Beck and Albert Ellis, of cognitive behavior therapy and REBT fame, respectively. Disclaimer: I believe I took accurate notes and correctly reported information which was presented in symposia and handouts. I invite any corrections and apologize for any omissions. I'm now off for a few days of real vacation!